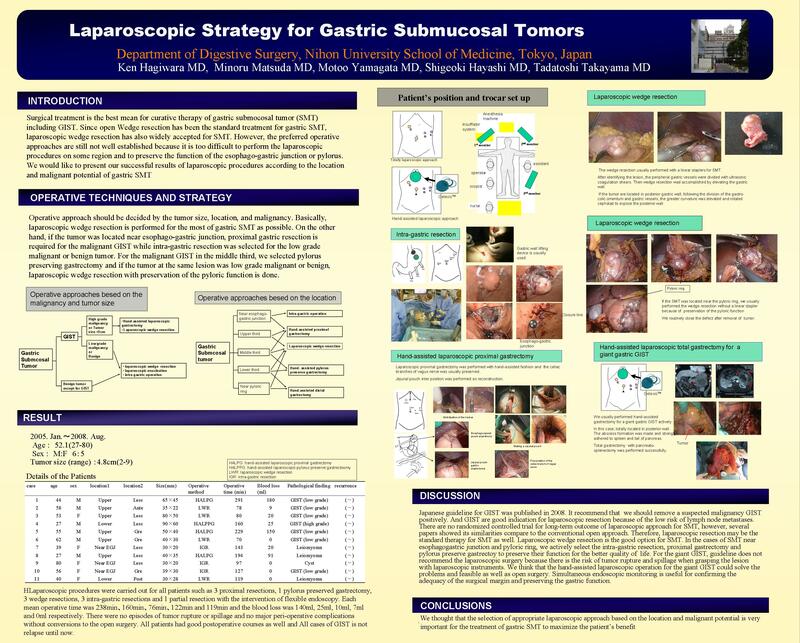 Laparoscopic Strategy for Gastric Submucosal Tumors. Introduction:Surgical treatment is the best mean for curative therapy of gastric submocosal tumor (SMT) including GIST, however, the preferred operative approaches are still not well established. We would like to present our successful results of laparoscopic procedures according to the location and malignant potential of gastric SMT. Operative Techniques:Operative approach should be decided by the tumor size, location, and malignancy. Basically, laparoscopic wedge resection is performed for the most of gastric SMT as possible. On the other hand, if the tumor was located near esophago-gastric junction, proximal gastric resection is required for the malignant GIST while intra-gastric resection was selected for the low grade malignant or benign tumor. For the malignant GIST near pyloric ring , we selected pylorus preserving gastrectomy as possible or distal gastrectomy and if the tumor at the same lesion was low grade malignant or benign, laparoscopic wedge resection with preservation of the pyloric function is done. Patients:11@Patients underwent the laparoscopic resection of gastric SMT from Jan. 1, 2005 to Aug. 1, 2008. There were 7 GIST, 3 leiomyoma and 1 cyst. Result: Laparoscopic procedures were carried out for all patients such as 3 proximal resections, 1 pylorus preserved gastrectomy, 3 wedge resections, 3 intra-gastric resections and 1 partial resection with the intervention of flexible endoscopy. Each mean operative time was 238minA160minA76minA122min and 119min and the blood loss was 140ml, 25ml, 10ml, 7ml and 1ml respectively. There were no episodes of tumor rupture or spillage and no major peri-operative complications without conversions to the open surgery. All patients had good postoperative courses as well. Conclusion:We thought that the selection of appropriate laparoscopic approach based on the location and malignant potential is very important for the treatment of gastric SMT to maximize the patientfs benefit.